Escape to the sea with the Caribbean Splash collection by C&F Enterprises. Coral and seashells in beach themed colors take you on a journey under the sea. Sea foam, lime, and pink make up the main colors of this pattern. Set against a crisp, white background, the colors really pop. Pair the quilt with a sea foam bedskirt and Euro shams to complete the beach inspired look. Mix and match throw seashell throw pillows to create your own custom look. With the shower curtain from the Caribbean Splash line, you can take the fun of the beach to your bathroom as well. Made by C&F Enterprises. Explore the treasures of the sea with the Caribbean Splash quilt set. In a colorful coastal palette of pink, orange, green and blue, coral and shells create an allover print on a white ground. Reverse to an aqua lace-inspired design for additional styling options. Crafted of cotton this quilt set is machine washable for easy care. 1 Twin Quilt and 1 Standard Sham, Measurements: Quilt 64" x 86"; Sham 20" x 26" , Hand Guided Cable Stitching, Coordinating Accent Pillows, Euro Shams and Bed Skirt Available Separately, Face 100% Cotton, Fill Material Polyester/Cotton Blend, Machine Wash Cold, Line Dry, Imported. Made by C&F Enterprises. 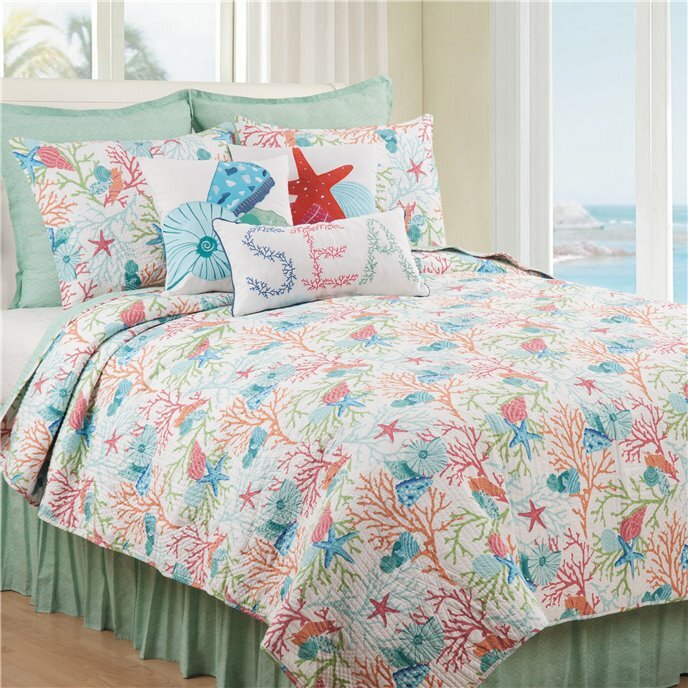 Explore the treasures of the sea with the Caribbean Splash quilt set. In a colorful coastal palette of pink, orange, green and blue, coral and shells create an allover print on a white ground. Reverse to an aqua lace-inspired design for additional styling options. Crafted of cotton this quilt set is machine washable for easy care. 1 F/Q Quilt and 2 Standard Shams, Measurements: Quilt 90" x 92"; Sham 20" x 26" , Hand Guided Cable Stitching, Coordinating Accent Pillows, Euro Shams and Bed Skirt Available Separately, Face 100% Cotton, Fill Material Polyester/Cotton Blend, Machine Wash Cold, Line Dry, Imported. Made by C&F Enterprises. Explore the treasures of the sea with the Caribbean Splash quilt set. In a colorful coastal palette of pink, orange, green and blue, coral and shells create an allover print on a white ground. Reverse to an aqua lace-inspired design for additional styling options. Crafted of cotton this quilt set is machine washable for easy care. 1 King Quilt and 2 King Shams, Measurements: Quilt 108" x 92"; Sham 20" x 36" , Hand Guided Cable Stitching, Coordinating Accent Pillows, Euro Shams and Bed Skirt Available Separately, Face 100% Cotton, Fill Material Polyester/Cotton Blend, Machine Wash Cold, Line Dry, Imported. Made by C&F Enterprises. Add a touch of island glam to your bed with the Brisbane Euro Sham. With a coastal flair twist on the beloved chevron pattern, this white-on-Aegan sham perfectly complements the various bedding collections by C&F Home. Crafted of 100-percent cotton and secured with a zipper closure, this sham is machine washable for easy care. Measures 26" x 26", Petite Flange for Tailored Look, Coordinating Quilts, Accent Pillows and Bed Skirt Available Separately, Cotton, Fill Material N/A, Machine Wash Cold, Tumble Dry Low, Imported. Made by C&F Enterprises. Add a touch of island glam to your bed with the Brisbane Bed Skirt. With a coastal flair twist on the beloved chevron pattern, this white-on-Aegan bed skirt perfectly complements your favorite bedding collections. Crafted in a 3 sided platform style, this bed skirt is crafted with a cotton drop and polyester platform and is machine washable for easy care. Measures 39" x 76", drop 18", Split Corners, Coordinating Quilt Set, Accent Pillows and Euro Shams Available Separately, Sides: 100% Cotton; Platform: 100% Polyester, Fill Material N/A, Machine Wash Cold, Tumble Dry Low, Imported. Made by C&F Enterprises. Add a touch of island glam to your bed with the Brisbane Bed Skirt. With a coastal flair twist on the beloved chevron pattern, this white-on-Aegan bed skirt perfectly complements your favorite bedding collections. Crafted in a 3 sided platform style, this bed skirt is crafted with a cotton drop and polyester platform and is machine washable for easy care. Measures 60" x 80", drop 18", Split Corners, Coordinating Quilt Set, Accent Pillows and Euro Shams Available Separately, Sides: 100% Cotton; Platform: 100% Polyester, Fill Material N/A, Machine Wash Cold, Tumble Dry Low, Imported. Made by C&F Enterprises. Add a touch of island glam to your bed with the Brisbane Bed Skirt. With a coastal flair twist on the beloved chevron pattern, this white-on-Aegan bed skirt perfectly complements your favorite bedding collections. Crafted in a 3 sided platform style, this bed skirt is crafted with a cotton drop and polyester platform and is machine washable for easy care. Measures 78" x 80", drop 18", Split Corners, Coordinating Quilt Set, Accent Pillows and Euro Shams Available Separately, Sides: 100% Cotton; Platform: 100% Polyester, Fill Material N/A, Machine Wash Cold, Tumble Dry Low, Imported. Made by C&F Enterprises. Who can’t appreciate all the beauty and mystery the sea has to offer? Style this unique embroidrered pillow in you beach house as a fond reminder of your favorite body of water. Featuring multicolored coral embroidery spelling out the word SEA, this pillow includes a removable insert and zipper closure for convenient care. Measures 12" x 24", Contrasting Blue Piped Edge, Filled and Finished in USA, 100% Cotton Cover, Fill Material Polyester, Spot Clean, Imported. Made by C&F Enterprises. Complete the look of your coastal décor with the Nautilus Trio Pillow. In a soothing colorway comprised of ocean blues and sea greens, this applique pillow features three embroidered nautilus shells atop a white ground. Measures 18" x 18", Clean Knife Edge Finish, Filled and Finished in USA, 100% Cotton Cover, Fill Material Polyester, Spot Clean, Imported. Made by C&F Enterprises. Your beach house isn't complete without the Starfish Trio Pillow. In a vibrant colorway comprised of orange, pink, and aqua, this applique pillow features embroidered starfish and shells atop a white ground. Measures 18" x 18", Clean Knife Edge Finish, Filled and Finished in USA, 100% Cotton Cover, Fill Material Polyester, Spot Clean, Imported. Made by C&F Enterprises. Caribbean Splash valance by C&F shows you a glimpse of underwater delights--- coral, shells, and sea stars on a pure white background. A tropical splash of colors: grass green, blues, dusty pink, and muted orange. 15.5" x 72", including 1.5" header, 2.25" rod pocket. Cotton. Exceptional value valance has a single layer of fabric. We offer the complete ensemble in the Caribbean Splash pattern by C & F.
The Caribbean Splash shower curtain adds a splash of color in the bath with an ocean-themed pattern of coral, sea stars, and shells in cheery colors of orange, green, blue, and pink on a white background. 72" x 72". We offer the complete ensemble in the Caribbean Splash pattern by C & F.